The Environmental Protection Agency (EPA) developed the Long Term 2 Enhanced Surface Water Treatment Rule (LT2 ESWTR) to reduce disease incidence associated with Cryptosporidium and other disease-causing microorganisms in drinking water. Laboratories performing Cryptosporidium analyses for LT2 ESWTR have been certified by the EPA for round one or by the applicable state program for round two. The Hygienic Laboratory received EPA approval for Method 1623 in 2002 for the first round of the LT2 ESWTR monitoring and wascertified by the Oregon Health Authority’s Laboratory Accreditation Program in 2014 for both methods for round two. week for round two and obtain a sampling calendar. EPA LT2 website with sampling guidance manuals. 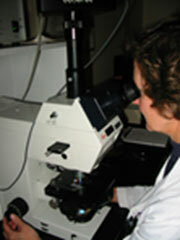 Photograph of Nancy Hall reading Cryptosporidium slides on section’s fluorescent microscope (SHL photo). There are two options for collecting Cryptosporidium/Giardia samples: submit bulk water sample OR filter in the field. For filtering in the field, the Hygienic Laboratory will provide the filta-max filter. Most facilities can make the sample field apparatus since most materials are on hand (e.g., pressure gauge, flow meter, flow control valve, hoses and clamps). A filter holder must be purchased from IDEXX to accommodate the filta-max filters for the sampling device. Sample shipment instructions will be provided. The normal turn-around time for printing a hard copy report is 10-14 days after receipt. Results may also be retrieved online. We provide color photographs (see below) of at least one cyst or oocyst found in sample with final reports. Top left: direct fluorescent antibody photo of a Cryptosporidium oocyst. 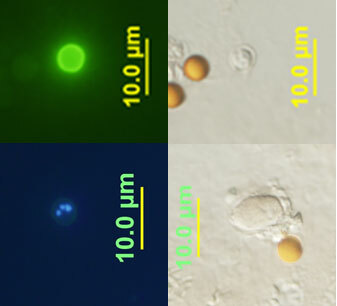 Top right: direct interference contrast photo of the same oocyst (orange bodies are some immunomagnetic beads from analysis). Bottom left: nuclear staining of a Cryptosporidium oocyst; four blue nuclei visible. Bottom right: differential contract photo of a Giardia cyst showing internal structures. Using a slight modification of this method, the Hygienic Laboratory was able to test unpasteurized apple cider linked to a local foodborne outbreak and was successful finding oocysts in the product.